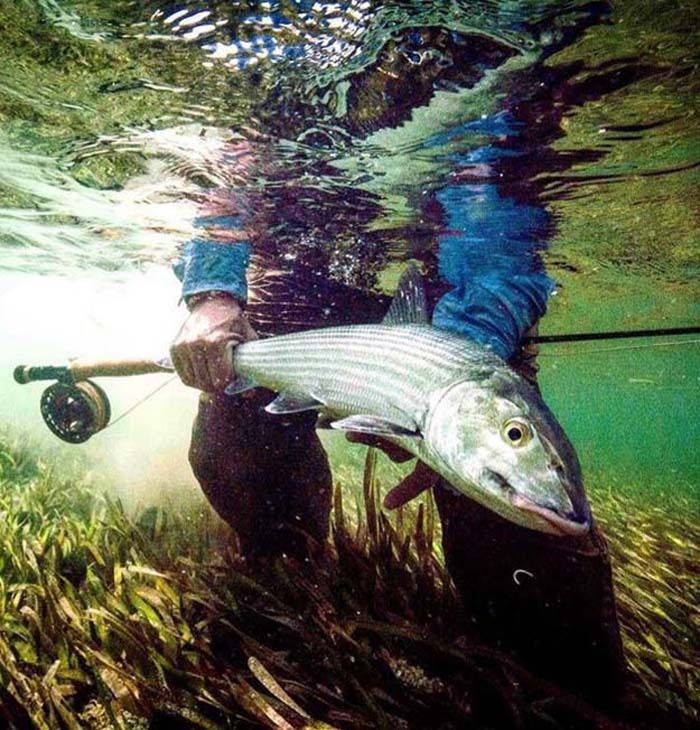 Bonefish and Tarpon Trust (BTT), in its third decade, has gathered an enormous amount of information about bonefish, as well as tarpon, and of late, permit. We collected the battery of scientific knowledge from BTT’s scientific database and created the following assemblage of some interesting facts, like bet you didn’t know. It is roundly believed that tobacco products, petroleum products of any kind or sunscreen are feeding deterrents to bonefish. Well, we can rule out one angler-perpetuated myth for sure – sunscreen. That, thanks to Kelly Hannan, Aaron Shultz, Zach Zuckerman, and Chris Haak. All scientists with bonefish on their minds. An underwater shot of Albula vulpes (Spookus easyus) by Captain Brandon Cyr. Did you know bonefish kept out of the water for more than 15 seconds are six times more likely to die post-release? Are bonefish less likely to consume bait (or a fly) contaminated by sunscreen? Assess whether bonefish show an aversion to sunscreen-contaminated bait (fly). Bonefish were collected from nearby flats and held at Bahamas’ Cape Eleuthera Institute (CEI) wet lab for a series of observations on their feeding behaviors. Experimental trials consisted of supplying bonefish with shrimp handled with oxybenzone-containing sunscreen (conventional sunscreen), zinc-based sunscreen, or clean wet hands. Researchers observed how long it took a bonefish to bite and spit the bait and measured the total weight of treated shrimp consumed. Results indicated that bonefish feeding behavior was unaffected by the addition of conventional and zinc sunscreens to the bait, and fish were neither attracted by nor dissuaded to consume the contaminated bait. They didn’t consume a different amount of shrimp when sunscreen was added and the time of their first bite did not change. Considering that bonefish rely primarily on their eyesight to identify prey, these results may not be surprising. Anglers should be more concerned with their choice of the fly than what they last touched when it comes to hooking fish. Bonefish rely on their eyesight more so than olfactory cues to find prey. Here, an infection brewing from too much slime (mucus) removed. BTT photo. The Experiment: How do sunscreen products and UV-blocking gloves affect fish health following handling? To examine the effects of handling a fish with contaminated hands, researchers simulated an angling event in the lab; fish were exercised via tail grabbing (a standard technique) around a large tank for 4 minutes. Then handled and air exposed for 1 minute to simulate hook removal. Before handling, researchers coated their hands with either conventional oxybenzone-containing sunscreen, zinc-based sunscreen, donned UV-blocking gloves, or had clean wet hands. Mucous removed by the researcher’s hands was weighed and recorded. Mucous, otherwise known as a fish’s slime layer, is the first line of defense for a fish, and slime removal is known to increase the likelihood of infection in fish, which in extreme cases can result in post-release mortality. Results suggest that oxybenzone containing sunscreen removed significantly more mucous than zinc-based sunscreen, gloves, or wet hands, and wet hands resulted in the least amount of mucous lost across all treatments. 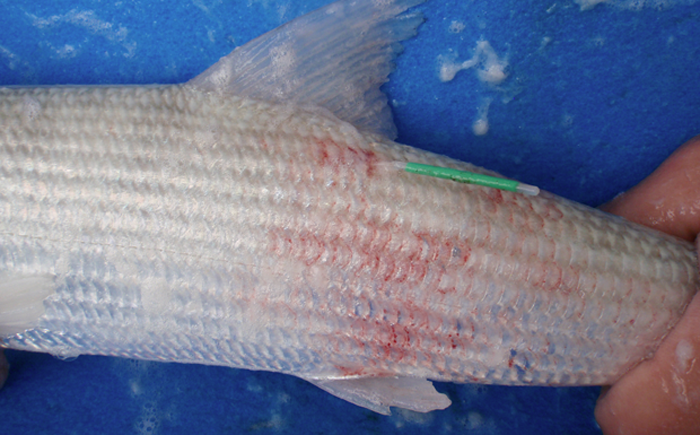 Throughout the experiment, only two fish displayed evidence of bacterial infection following handling, and both fish were exposed to the zinc sunscreen treatment. Based on these results, anglers should consider avoiding handling of fish with sunscreen-coated hands, as well as with UV gloves. To best protect oneself from the sun with bonefish welfare in mind, rely on UV-blocking gloves, but remove them before handling a fish. For some reason, one difficult to explain, bonefish are of particular interest to the editor/owner and publisher emeritus of this magazine. We’ve both fished for them in distant places: Florida Keys; Isla de Culebra, Puerto Rico; Belize; Yucatan, Mexico; the Bahamas, Turks & Caicos, and the Seychelles. NOTE: Featured Image is the Bahamas captured bonefish. Photo Bonefish & Tarpon Trust. NOTE 2: All of the information presented is sourced from Bonefish & Tarpon Trust’s magazine, blogs, newsletters, press releases and BTT’s Symposium Abstracts and Presentations.